Golden Moon Lab’s CH Sunny Coreopsis, CGC, WC – “Corey” wins Best Of Breed at the Boston, MA show April 5, 2009. 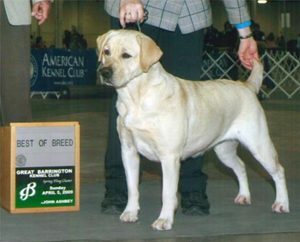 Corey earned her Junior Hunt Title in Remington, VA on November 18, 2012 when she qualified with perfection in 5 out of 5 AKC Hunt Tests. Corey is a truly happy spirit – we call her the “party dog”. She does everything well & with gusto – showing, agility, field work, play. She’s a very versatile girl.